Gate City Town Hall is located at 156 East Jackson Street, Gate City, VA 24251; phone: 276-386-3831. Photo: Jackson Street, Gate City Historic District, Town of Gate City, VA. The Historic District was listed on the National Register of Historic Places in 2010. Photographed by User:Betcantrell (own work), 2013, [cc-by-3.0 (creativecommons.org/licenses/by/3.0)], via Wikimedia Commons, accessed July, 2015. The town of Gate City, the county seat of Scott County, lies nestled in the Clinch Mountains of southwest Virginia, about 3 miles north of the Tennessee line. Steep hills, dense forests, and fertile valleys for farming characterize the surrounding area. The town retains much of its original building stock, particularly in many of its neighborhoods and the downtown commercial district, which includes antique stores, hardware stores, a department store, restaurants, a drug store, and professional offices, along with some dwellings and governmental buildings. The Gate City Historic District is an architecturally and historically significant concentration of mainly Commercial-style buildings that reflects the development of Gate City's current central business district during the late 19th and early 20th centuries. Built between ca. 1829 and ca. 1960, the buildings chronicle the historical development of the town's commercial activity. Today, Gate City is poised to begin extensive economic development and revitalization of its downtown area. The origins of Gate City date to 1771 when Silas Engart received a land grant of 200 acres that included the location of the future town. By the time of Scott County's formation in 1815, landowner James Davidson, Sr. donated approximately 13 acres of his plantation for establishing the county seat. The location of the town was such that it would emerge as a vital commercial center for people and goods traveling through Big Moccasin Gap and the Holston River. When the county seat was established in 1815, it was named Winfield in honor of famed War of 1812 hero Gen. Winfield Scott. The main street of the new town honored war hero and future president Andrew Jackson. The town was divided into thirty-four lots, beginning at the site of 114 West Jackson Street (formerly Chris's department store). Seventeen lots were laid out along the north and south sides of Jackson Street. Two of these lots were set aside for construction of the Scott County Courthouse and Jail in 1829. In 1817, the town was renamed Estillville in honor of Benjamin Estill, a local judge instrumental in the formation of the new county. As a result of the county seat's location between Big Moccasin Gap and the Holston River, a number of businesses began to appear around the courthouse. Soon, the town grew into a thriving commercial center for people passing through on their way westward, for farmers hoping to sell goods, and businessmen in town for legal affairs. The town's importance as a transportation center also emerged, with a regular wagon train and coach line service conveying people, mail, and commercial goods between Bedford and Estilville. Gate City received its present name in 1886, when Gen. Rufus A. Ayers pointed out that proximity to Big Moccasin Gap marked the town as the "Gate Way to the West." The town was incorporated in 1892. Besides serving as a business and government center, Gate City was also home to the Shoemaker College, established in 1897 and named after Col. James L. Shoemaker, a successful businessman who provided funds to the county for educational needs. The co-educational college was in operation for only a short time. Due to financial difficulties the institution closed in 1906; the campus now houses an elementary school. By the beginning of the twentieth-century, Gate City was one of several "boom towns" located in the southwestern region of the state. Although the streets were little more than dirt byways in the town, the area was a vibrant commercial and transportation center. As many as six daily passenger trains passed through Gate City. The town also had a railroad log yard where logs from all over the county were stored and then loaded to be later transported by train. Iron ore from the Snowflake and Nickelsville areas as well as glass sand from the south of Clinch Mountain were manufactured and shipped from Gate City. In addition, the town had a thriving manufacturing center in the area of Water Street where wood pumps, staves, sleds, and harnesses were built. By 1915, the town supported two livery stables on Willow Street and a blacksmith shop on Jackson Street, as well as a dentist's office, an ice plant, a casket shop, and a furniture manufacturing business. By the 1930s, Gate City had three movie theaters, banks, and a hotel. The town also had two businesses that dealt with auto sales and repairs. On Sanborn Insurance Maps of Gate City dating to 1927, Gate City's commercial district appears as a tightly packed grouping of businesses, government buildings, churches, dwellings, and warehouses. The most common type of commercial architecture was the two-part commercial block, a distinctive type of commercial architecture composition that dominated many small towns and cities from approximately 1850 to 1950. Many of the commercial buildings in Gate City were expressions of the shop-house form, which dates back in the United States to colonial times. The shop-house building consists of two areas; the first floor or public area where the business resided and a private area, usually upstairs where a family or individuals resided. As the demand for services and goods grew throughout the nineteenth century, the shop-house, particularly the private space, gradually gave way to spaces used expressly for commerce, office activities, or, in some cases, light manufacturing. True to historical antecedents, the commercial buildings are typically jammed tightly together close to street level. However, areas of clear, open spaces display the more traditional layout of the courthouse and jail. On the 1927 map, the area to the east of the courthouse is open; by 1940, a small public library would be built there. In keeping with the pattern of government buildings being clustered together, the town post office was originally located across the street from the courthouse on the corner of Jackson Street and Moccasin Street (now Manville Road). The church lots also were built with an eye to open ground areas, which help break up the otherwise monolithic appearance of the commercial blocks along Jackson Street. With late twentieth-century development and modernization, the commercial district of Gate City today contains more open spaces in the form of commercial parking lots, built where earlier buildings once stood. Based on the Sanborn maps, Jackson Street served as the town's main commercial artery. Manufacturing and other businesses such as the harness business, the hitchings shed, and other storage facilities tended to operate away from the main commercial center on thoroughfares parallel to Jackson Street, such as Water Street on the south and Willow Street on the north. However, by the 1950s and 1960s, the town's momentum was slowing. As industry in Kingsport, Tennessee (6 miles to the south) attracted Gate City residents, several local businesses and small manufacturing companies shut down. Train service gradually dwindled. Although Gate City still serves as the county seat, the downtown area is clearly in a state of transition as many former commercial buildings now stand vacant. The overall effect of the two-part commercial block in Gate City is unified and orderly. The majority of buildings were constructed of concrete block, stone or brick. Ornamentation, in the form of brick corbelling, cornices, quoins, and window ornament, is copious but usually restrained, leaning toward Classical elements rather than the highly agitated and fussy ornamentation seen on commercial buildings of the late Victorian period. 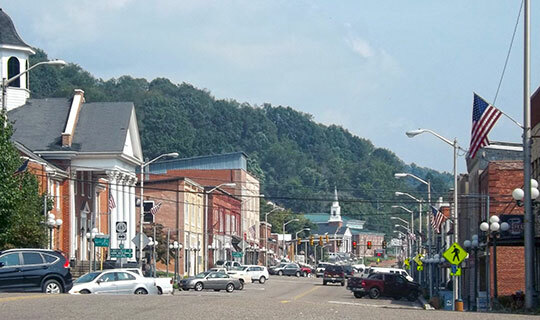 Together, the buildings in the Gate City Historic District remain an important reminder of the historical development of the town's central business district and, as a group, illustrate the history of commercial building traditions in the southwest Virginia region. Meg Green Malvasi, Architectural Historian, William and Mary Center for Archaeological Research, Gate City Historic District, Scott County, Virginia, nomination document, 2010, National Park Service, National Register of Historic Places, Washington, D.C.